Scandinavia pioneered the use of natural stone rainscreen systems in the 1960s and we are proud to partner a leading Danish provider of this specialist stone rainscreen cladding in the UK. 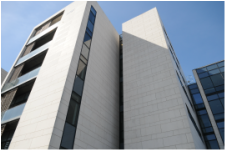 Lightweight, versatile, rapidly fixed and suitable for high-rise buildings, our new precision-cut limestone, granite, slate and Basalt natural stone cladding rainscreen range is already proving popular with architects. We are still in the process of finalising our range of natural stone rainscreen finishes and we'll have more on display in the near future. Please call or email us to discuss your natural stone rainscreen projects.